Dubai, UAE, November 04, 2018: Carl F. Bucherer CEO Sascha Moeri presented the new Heritage Tourbillon DoublePeripheral Limited Edition at a celebratory event in New York’s vibrant SoHo district. The launch of this timepiece marks one of many highlights in the company’s anniversary year and pays tribute to the rich tradition of the Swiss watch manufacturer from Lucerne. Limited to only 88 watches, the special-edition masterpiece also marks the start of a new product range set to carry on Carl F. Bucherer’s legacy: the Heritage collection. The first model from the new Heritage collection is limited to just 88 pieces – a homage to the year Carl F. Bucherer was founded, 1888. The cosmopolitan and internationally renowned luxury watch man- ufacturer was established in Lucerne in the heart of Switzerland. The new timepiece reflects the golden luster of the baroque city itself, with an elaborately finished 42.50 mm, 18-karat rose gold case. 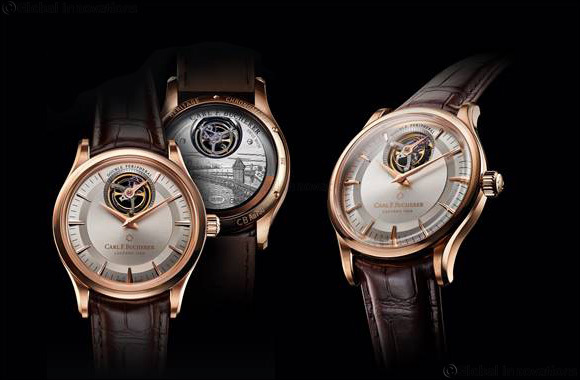 Another homage to the birthplace of Carl F. Bucherer is the movement bridge crafted in 18-karat white gold, which features a hand-engraved cityscape of Lucerne. It covers the entire back of the movement, with the excep- tion of the tourbillon. At the center of the intricate engraving – the result of more than two weeks of meticu- lous craftsmanship – is the Lucerne Chapel Bridge, the landmark of the city. There is a special detail in this engraving: a swan. This reference to Lucerne’s Schwanenplatz alludes to where Carl F. Bucherer opened its first specialty store back in 1888, not far from where the boutique is located today. The position of the swan differs on each of the 88 models – a custom feature that further underlines the unique character of each of these timepieces. 130 years. Beautiful and innovative timepieces that epitomize quality, passion, and the utmost precision are born out of a rich heritage and a firm eye on the future. A long history of triumphs in watchmaking design and technology has led to Carl F. Bucherer’s acceptance into the exclusive circle of the Fondation de la Haute Horlogerie. This is testament to the Lucerne watch manufacturer’s continual endeavors to uphold the values of traditional watchmaking as well as its outstanding craftsmanship and sophistication.